School of Pharmacy, University of Nizwa P.B No 33, PO 616, Birkat Al Mouz, Nizwa, Sultanate of Oman. *Address correspondence and reprints request to: Jimmy Jose, School of Pharmacy, University of Nizwa P.B No 33, PO 616, Birkat Al Mouz, Nizwa, Sultanate of Oman. Jose J, Jimmy B, AlSabahi GMS, Al Sabei GA. A Study Assessing Public Knowledge, Belief and Behavior of Antibiotic Use in an Omani Population. Oman Med J 2013 Sept; 28(5):324-330. Objective: This study was aimed to assess public knowledge, belief and behavior towards antibiotics use in a general population in the Sultanate of Oman. Methods: A 12-item self-administered questionnaire was distributed to 850 prospective participants by researchers using quota sampling in two governorates of Oman. The data obtained were evaluated to assess the responses to individual questions related to knowledge, belief and behavior of antibiotic use. Median score of the respondents was correlated with participant demographics and status on use of antibiotics. Results: A total of 718 completed questionnaires were obtained giving a response rate of 85%. The median total score of the participants was 16 (Interquartile range: 6) out of a possible maximum score of 24. A moderate knowledge and behavior score was observed, while the belief score of the participants was low. A significant difference was observed in the median total score based on age group, educational qualification and employment status. Conclusion: Antibiotics are frequently used by the public. An inappropriate belief on antibiotic related aspects was observed and inappropriate behavior was noticed, which are reflections of insufficient knowledge and wrong beliefs. Interventions must be put in place to educate the public on appropriate antibiotic use. Keywords: Knowledge, Belief, Behavior; Antibiotics; Public; Oman. Hence, this study aims to assess public knowledge, belief and behavior of antibiotic use in two representative governorates out of the ten governorates in Oman. The findings from this study would be a useful addition to the existing literature on this subject and may provide useful data which could form the basis for educational campaigns on rational use of antibiotics, thus addressing any misconceptions among the public. This study was based on a 12 item self-administered questionnaire developed for the stated objective. The questionnaire was designed based on previously conducted studies.7,9,14,17 It consisted of three subscales designed to assess the knowledge (4 questions), belief (3 questions) and behavior (5 questions) related to antibiotic use. Knowledge related questions were designed to evaluate the basic knowledge of participants; while the belief section focused on the respondents’ belief with regards to the use of leftover antibiotics and the need for compliance in relation to duration and dose; and the behavior section attempted to determine the behavior of the respondents towards compliance to duration of treatment course and dose regimen, as well as purchasing and sharing antibiotics with others. The responses were based on a 3 point Likert type scale which ranged from agree, disagree to unsure. This study was approved by the Institutional Research Committee, College of Pharmacy and Nursing, University of Nizwa, Sultanate of Oman. Moreover, the questionnaire contained a component for obtaining information on the demographics, details on frequency of use of antibiotics in the past and status of antibiotic use over the last one year. The questionnaire was designed in English but was first translated into Arabic, and then further retranslated into English to ensure appropriate translation. It was solely prepared by one of the researchers, the content validity of the questionnaire was assessed by two other investigators (academic faculty at the department of pharmacy practice) who are content experts on the theme of the study. The assessment was more subjective in nature, relying on the comments of the members on the representation and clarity of items of the questionnaire under individual subscales, as well as the scoring system. The actual survey was conducted during a 2-month period from June to July 2011 among the general public in Al Batnah and Al Dakhliyah governorates; two representative governorates among the ten governorates in Oman. The general public in these regions were approached by a researcher using quota sampling for age and gender, followed by convenience sampling for participant enrolment. The inclusion criteria consisted of members of the public aged between 18-60 years, who were neither healthcare professionals nor students from any medical/health related field. Additional criteria included participants who could understand the term antibiotic and had used an antibiotic at least three times in their lifetime. The study information sheet was given to the potential respondents followed by a verbal explanation. Signed informed consent was obtained upon agreeing to participate in the survey. Although the questionnaire was designed to be self administered, some of the questionnaires were in fact completed by the investigator for a few respondents who did not have a formal education. On average, the participants required 15-20 minutes to complete the self-administered questionnaire. The data from the completed questionnaires was evaluated for various parameters. The responses in the three sections (knowledge, belief and behavior) were assessed by estimating the percentage of each "agree, disagree and unsure" responses selected by the respondents. Further, the questions related to knowledge, belief and behavior were assessed using a scoring scheme with score of 2, 1 and 0 for correct, unsure and incorrect responses, respectively. 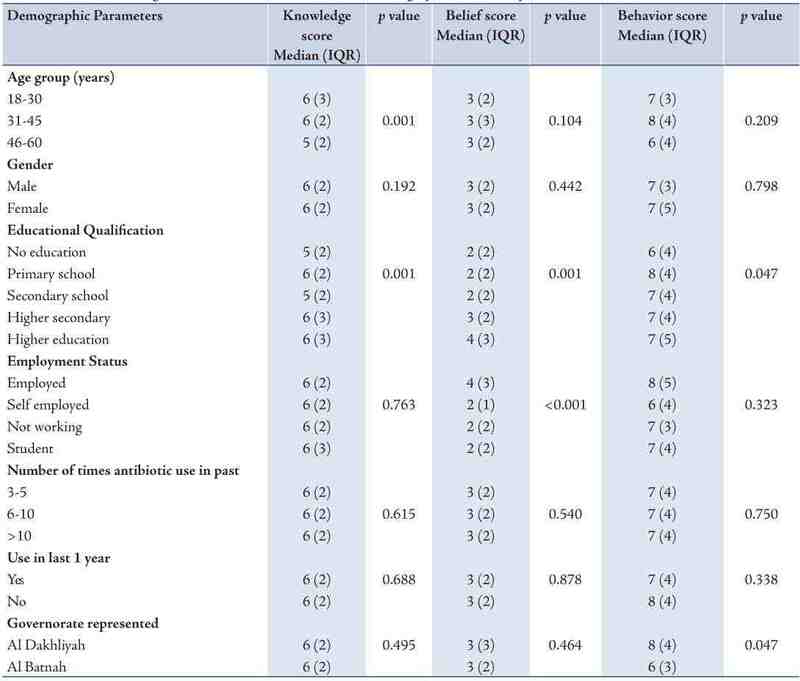 Accordingly, the median knowledge, belief and behavior score was estimated with a maximum possible score of 8, 6 and 10, respectively; and a minimum score of zero for all the categories. Moreover, the median total score based on responses to all three sections was estimated with a maximum possible score of 24 and a minimum score of zero. For quantitative representation, a score greater than 80% of the possible maximum score was considered as good, between 60-80 as moderate and less than 60% as poor. The median total score as well as the median score for knowledge, belief and behavior sections was compared based on the demographics of the respondents, frequency of antibiotic use in the past and status of antibiotic use in the past one year. Statistical analysis was performed with SPSS (version 15) using the Mann-Whitney U test and Kruskal Wallis test for continuous variables depending on the number of comparative groups. Statistical significance was set at p<0.05. A total of 718 completed questionnaires were obtained from the distributed 850 questionnaires, giving a response rate of 85%. The characteristics of the respondents are presented in Table 1. Comparatively, there were a slightly higher percentage of females, and the respondents were mainly in the age group of 18-30 years. A majority of the respondents were well educated, having obtained higher educational qualification (46%) and 44% were employed. Among the respondents, use of antibiotics was observed to be frequent with almost 30% of cases indicated having used an antibiotic more than 10 times in the past and 66% used antibiotics at least once in the past one year. Responses to questions assessing the knowledge, belief and behavior of the respondents are summarized in Table 2. Table 1: Participant demographics, other parameters, and median total score. In terms of knowledge, a median score of 6 (IQR: 2) was obtained out of a maximum possible score of 8, which demonstrates moderate knowledge on antibiotic use related aspects. However, 31% agreed with the statement that antibiotics are useful for all types of common cold and cough. Whilst a median belief score of 3 (IQR: 2) out of a possible maximum score of 6 was obtained which demonstrates a low scoring for the belief related aspects. A minor percentage of the respondents believed antibiotic remaining after use could be stored and used again for similar symptoms without a doctor's instructions. Whereas, a median behavior score of 6 (IQR: 3.25) was obtained from a possible maximum score of 10, which demonstrates a moderate score towards the lower end of the scale. The results revealed that the majority of respondents always completed the antibiotic course for the prescribed period by their doctors and 60% of reported of not having missed any of doses. However, approximately 40% shared antibiotics with someone else in their family or friends with similar symptoms and about half of all respondents stopped taking the antibiotic when the symptoms did not improve. Table 2: Response to knowledge, belief, and behavior related questions. Table 3: Median knowledge, belief, and behavior score based on demographics and other parameters. Tables 1 and 3 present the relationship between the median scores and characteristics of the participants. The median total score based on the responses to all the questions was 15 (IQR: 6) out of a possible maximum score of 24, which demonstrates a moderate score. Upon evaluation of the difference in the median total score based on demographics of the participants, no significant difference was observed based on gender, but there was a significant difference in terms of age group (p=0.003), educational qualification (p<0.001), and employment status (p=0.004), as shown in Table 1. Participants comprising the 46-60 age group obtained a lower score and those who were employed obtained a higher score compared to other groups. The median total score did not differ in terms of the frequency of use of antibiotics in the past and status of using antibiotics in the recent past. However, a significant difference was observed between the total score and the governorate the participants represented (p=0.044). Also, there was a significant difference observed in the knowledge score with respect to age group (p=0.001) and educational qualification (p=0.001); while the belief score differed in terms of educational qualification (p=0.001) and employment status (p<0.001). However, no significant difference was apparent in the behavior score, except in terms of educational qualification (p=0.047) and the governorate the participants represented (p=0.047). In terms of knowledge, it was discouraging to note that a good percentage of the participants were unaware of the indications for use of their medications, similar to the results of a study conducted in North Dakota where only 52% were aware that antibiotics are used to treat bacterial infections.22 Furthermore, even though 48% disagreed to the statement that "antibiotics could be used for all types of common cold and cough", 39% thought antibiotics could be used irrespective of the cause or type. In the studies conducted elsewhere, a good percentage of participants similarly reported that antibiotics work effectively against most colds and coughs.10,14,17 This demonstrates the need for appropriate public education on the purpose and action of antibiotics. Although, the majority of respondents seemed to be aware that antibiotics cannot be purchased without a doctor’s prescription, it was noted that 18% thought that they could still do so. In the study conducted by Cunney et al. 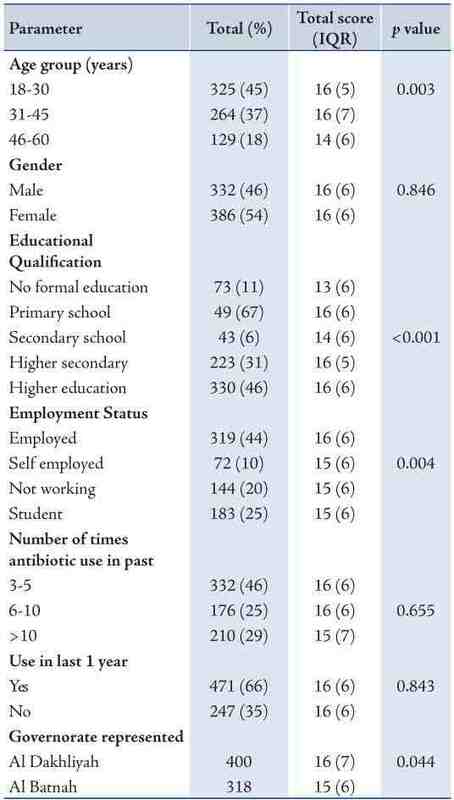 in Ireland, 14% of respondents were reported to even consider using antibiotics without prescriptions for themselves.21 In the current study, the median knowledge score of 6 (IQR: 2) obtained demonstrates a moderate knowledge of antibiotic use related aspects; thus indicating that there is room for improving the participants’ knowledge of antibiotic use through educational interventions and appropriate communication by healthcare professionals during prescribing, dispensing and follow-up. Whilst the belief of some of the study participants that "leftover antibiotics could be stored and used again for the same symptoms without the doctor’s prescription" may result in irrational and irresponsible use of antibiotics which could affect the patient’s disease condition, contribute to bacterial resistance and sometimes result in usage of expired drugs. In the global survey conducted by Pechere et al. a higher rate of wrong belief among the public was reported with 62% believing that leftover antibiotics can be saved and used again.7 Also, a study conducted in the United Kingdom (UK) also identified good number of respondents reported to have kept antibiotics for future use.17 In the current study, over half of the respondents believed antibiotics could be stopped once they feel better from the symptoms; while again the study conducted in the UK, 65% reported not having finished antibiotic course because they felt better or forgot to take them.17 The participants in the present study had a low belief score, thus it is evident that the public hold inappropriate beliefs with respect to antibiotic use which could adversely affect the way they are used. Public education is the best way to overcome such incorrect beliefs. It is reasonable to call for strict regulatory control to ensure that antibiotics are not dispensed by pharmacists without a prescription. On the other hand, there was a significant percentage of the respondents who were not able to comply with the prescribed antibiotic regimen in our study. Even though Kardas et al.6 reported 40% of patients not adhering to antibiotic treatment, in the study conducted in UK, only 11% reported not having finished their last antibiotic course as prescribed.17 The results of our study demonstrates the need for healthcare professionals, physicians and pharmacists to take appropriate steps towards proper counselling to ensure patient compliance with antibiotic regimen. A behavior score towards the lower end of moderate level observed in the current study is in effect a reflection of the impact of the respondents’ knowledge and belief on antibiotic use; improvement of both factors would therefore result in improved practice and rational use. Our study did have some limitations however. The participants above the age of 60 were excluded since the questionnaire was designed to be self-administered and we expected there to be more illiterates in this particular age group; hence, there is no representation pertaining to that age group. Also, since age and gender were the only parameters considered for quota sampling and not educational qualification, there was an unexpectedly high proportion of participants with higher educational qualification compared to other groups; which might have had an impact on the study findings. Recall bias might have influenced the responses to the question on "number of times antibiotic used in past" as would be logically expected. Furthermore, the questionnaire was completed by the investigator in a few cases where the respondents had no formal education. Another important aspect is the fact that the data obtained represents only two out of 10 governorates in Oman, while there might be some degree of cultural differences and differences in the level of education between the populations occupying different regions of Oman. However, since the public health related policies, healthcare delivered and public campaigns work hand in hand in all regions, the generalization still stands. Nonetheless, a nationwide study with representation from individual regions which would be more of an ideal representation of the entire population of the country should be planned. The results of the survey demonstrate that antibiotics are frequently used. But while some of the findings are quite encouraging, the median knowledge score of the participants was moderate, thus indicating that there is ample room for improvement of the public’s knowledge of appropriate antibiotic use. Practice of procuring and using antibiotics without a prescription warrants the need for strict regulatory enforcement among pharmacies on dispensing antibiotics, along with public education to avoid antibiotic misuse. While inappropriate beliefs of antibiotic related aspects were generally observed which need to be addressed through public educational interventions. Also, the low behavior score observed in the study was a reflection of insufficient knowledge and inappropriate belief among the public. A significant difference in the score based on respondent demographics was observed for certain characteristics of the respondents. Thus, appropriate educational interventions should be designed to reach and educate the public on such important issues taking into account the cultural and social context in which the beliefs and practices have developed. Patients as well as healthcare professionals have a major role to play in attaining rational antibiotic use. Various methods including media, public education programs and appropriate education from healthcare professionals could be practiced in order to realize this important objective. We would like to thank the participants of the survey for their time and effort. We would also like to express gratitude to Ms. Naqeai Al-Rashdi, Department of Language translation, University of Nizwa for her assistance in translation and Dr. Sabin Thomas, School of Pharmacy for his valuable inputs during the design of the questionnaire. There were no conflicts of interest for the study. This research received no specific grant from any funding agency in the public, commercial or not-for-profit sectors. 1. Dy ER. Inappropriate antibiotic use in Philippines. Phil J Microbiol Infect Dis 1997;26(2):77-87. 2. Kardas P, Devine S, Golembesky A, Roberts C. A systematic review and meta-analysis of misuse of antibiotic therapies in the community. Int J Antimicrob Agents 2005 Aug;26(2):106-113. 3. Anastasio GD, Little JM Jr, Robinson MD, Pettice YL, Leitch BB, Norton HJ. Impact of compliance and side effects on the clinical outcome of patients treated with oral erythromycin. Pharmacotherapy 1994 Mar-Apr;14(2):229-234. 4. Bitarães EL, Oliveira BM, Viana MB. Compliance with antibiotic prophylaxis in children with sickle cell anemia: a prospective study. J Pediatr (Rio J) 2008 Jul-Aug;84(4):316-322. 5. Kardas P. Patient compliance with antibiotic treatment for respiratory tract infections. J Antimicrob Chemother 2002 Jun;49(6):897-903. 7. Pechère JC, Hughes D, Kardas P, Cornaglia G. Non-compliance with antibiotic therapy for acute community infections: a global survey. Int J Antimicrob Agents 2007 Mar;29(3):245-253. 8. van Dulmen S, Sluijs E, van Dijk L, de Ridder D, Heerdink R, Bensing J. Patient adherence to medical treatment: a review of reviews. BMC Health Serv Res 2007;7:55. http://www.biomedcentral.com/1472-6963/7/55. 9. Kandakai TL, Price JH, Telljohann SK, Holiday-Goodman M. Knowledge, beliefs, and use of prescribed antibiotic medications among low-socioeconomic African Americans. J Natl Med Assoc 1996 May;88(5):289-294. 10. Shehadeh M, Suaifan G, Darwish RM, Wazaify M, Zaru L, Alja’fari S. Knowledge, attitudes and behavior regarding antibiotics use and misuse among adults in the community of Jordan. A pilot study. Saudi Pharm J 2012 Apr;20(2):125-133. 12. Mohanna M. Self-medication with antibiotic in children in Sana’a city, Yemen. Oman Med J 2010 Jan;25(1):41-43. 13. Prakasam KC, Kumar N, Ramesh J. Student's knowledge of antibiotics: A cross-sectional study of students in Tamil Nadu. International Journal of Pharmacy and Pharmaceutical Science 01/2011;3(1):232-233. 14. Curry M, Sung L, Arroll B, Goodyear-Smith F, Kerse N, Norris P. Public views and use of antibiotics for the common cold before and after an education campaign in New Zealand. N Z Med J 2006;119(1233):U1957. http://www.nzma.org.nz/journal/119-1233/1957/. Accessed 13 Jul 2012. 15. Vanden Eng J, Marcus R, Hadler JL, Imhoff B, Vugia DJ, Cieslak PR, et al. Consumer attitudes and use of antibiotics. Emerg Infect Dis 2003 Sep;9(9):1128-1135. 16. Chan GC, Tang SF. Parental knowledge, attitudes and antibiotic use for acute upper respiratory tract infection in children attending a primary healthcare clinic in Malaysia. Singapore Med J 2006 Apr;47(4):266-270. 17. McNulty CA, Boyle P, Nichols T, Clappison P, Davey P. The public’s attitudes to and compliance with antibiotics. J Antimicrob Chemother 2007 Aug;60(Suppl 1):i63-i68. 18. Khandekar R, Shama Mel-S, Mohammed AJ. Noncompliance with medical treatment among glaucoma patients in Oman–a cross-sectional descriptive study. Ophthalmic Epidemiol 2005 Oct;12(5):303-309. 19. Tenaiji A, Al Redha K, Khatri F, Darmaki S, Hosani S, Al Neaimi M, et al. Knowledge, attitudes and behavior towards antibiotic use among parents in Al-Ain City, United Arab Emirates. 13 th International Congress on Infectious Diseases, Abstract, Conference Presentations, Kuala Lumpur, Malaysia, June 19-22, 2008. Available at ww2.isid.org/Downloads/13th_ICID_ProgSunday.pdf. Accessed on 12 July 2011. 21. Cunney R, Murphy N. Household antibiotic use and antibiotic beliefs in Ireland. SARI. Available at URL: http://www.hpcs.ie/hpsc/A-Z/Microbiology Antimicrobial Resistance/European Surveillance of Antimicrobial Consumption ESAC/Publications and Presentations/File,1077,en.pdf. Accessed on July 12, 2011. 22. North Dakota State Data Centre. October2000. Antibiotic Resistance, Knowledge Survey Results: Comparison of the 1999 and 2000 Surveys. Available at http://www.ndsu.edu/sdc/publications/reports/Pharmacy2000_Final.pdf. Accessed on 7 /Aug/ 2011. 23. Price EL, Mackenzie TD, Metlay JP, Camargo CA Jr, Gonzales R. A computerized education module improves patient knowledge and attitudes about appropriate antibiotic use for acute respiratory tract infections. Patient Educ Couns 2011 Dec;85(3):493-498. 24. Ashe D, Patrick PA, Stempel MM, Shi Q, Brand DA. Educational posters to reduce antibiotic use. J Pediatr Health Care 2006 May-Jun;20(3):192-197. 25. McNulty CA, Nichols T, Boyle PJ, Woodhead M, Davey P. The English antibiotic awareness campaigns: did they change the public’s knowledge of and attitudes to antibiotic use? J Antimicrob Chemother 2010 Jul;65(7):1526-1533. 26. Woodhead M, Finch R; Public Education Subgroup of SACAR. Public education - a progress report. J Antimicrob Chemother 2007 Aug;60(1)(Suppl 1):i53-i55. 27. Huttner B, Goossens H, Verheij T, Harbarth S; CHAMP consortium. Characteristics and outcomes of public campaigns aimed at improving the use of antibiotics in outpatients in high-income countries. Lancet Infect Dis 2010 Jan;10(1):17-31. 28. Goossens H, Guillemot D, Ferech M, Schlemmer B, Costers M, van Breda M, et al. National campaigns to improve antibiotic use. Eur J Clin Pharmacol 2006 May;62(5):373-379. 29. Gellad WF, Grenard J, McGlynn EA. (RAND Health Corporation). A Review of Barriers toMedication Adherence: A Framework for Driving Policy Options. (RAND Healh, wrpoation). Available at http://www.rand.Org/pubs/technical_reports/2009/RAND_TR765.Pdf. accessed on 19/Oct/2011. 30. Jimmy B, Jose J. Patient medication adherence: measures in daily practice. Oman Med J 2011 May;26(3):155-159. 31. Kotwani A, Wattal C, Joshi PC, Holloway K. Irrational use of antibiotics and role of the pharmacist: an insight from a qualitative study in New Delhi, India. J Clin Pharm Ther 2012 Jun;37(3):308-312. 32. Butler CC, Simpson SA, Dunstan F, Rollnick S, Cohen D, Gillespie D, et al. Effectiveness of multifaceted educational programme to reduce antibiotic dispensing in primary care: practice based randomised controlled trial. BMJ 2012;344:d8173.